Welcome to the Free Library of Philadelphia Charles Santore Branch! Warmest greetings from the Friends of the Charles Santore Library! We’re excited to kick off a variety of programs and initiatives in support of the Library. As the New Year approaches, we’re also eager to promote the Library’s four main initiatives. We believe that a fresh focus on organization, special events, fundraising, and recruiting will ensure that this invaluable resource serving the Bella Vista, Queen Village, and surrounding communities remains open, accessible, and in service of its visitors. Communications Committee – Getting the word out about the Friends’ goals and Library events is crucial to moving all other initiatives forward. We’re dedicated to providing regular updates on programming, events, opening and closing hours, and more. Special Speaker Series Programming – We are excited to announce the first installment in our ongoing speaker series. 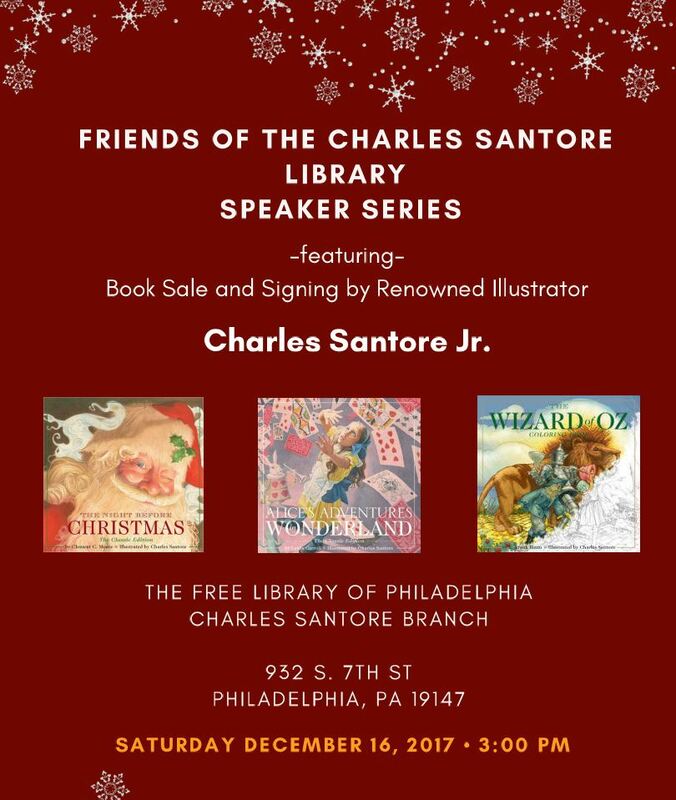 Renowned artist and illustrator Charles Santore Jr. will appear at the Library on Saturday, December 16, 2017 at 3:00 pm. He will be signing copies of the Wizard of Oz, his famous rendition of The Night Before Christmas, and his new edition of Alice in Wonderland. Capital Campaign Fundraising – Our 2018 Capital Campaign is underway, and the Friends are seeking 250 Bella Vista supporters and 250 Queen Village supporters willing to give $20 each towards our goal of $10,000. Additionally, we are offering patron-level status for individuals and families. Sponsorship opportunities are also available for business donations. Please see the Donation Page of our website: http://santorelibrary.org/donate. Volunteer Recruiting – We are currently seeking new members for our advising board, and positions are currently open for officers, communication committee members, fundraising, capital projects, and our evolving special events campaign. If you are interested in getting involved, please contact me at jsmyth@rpsdirect.com, or Mitchell Bach at mbach@eckertseamans.com. The mission of the Free Library of Philadelphia is to advance literacy, guide learning, and inspire curiosity. The Friends of the Free Library of Philadelphia is an independent, non-profit organization whose mission is to support the Free Library of Philadelphia through affiliate neighborhood volunteer groups. 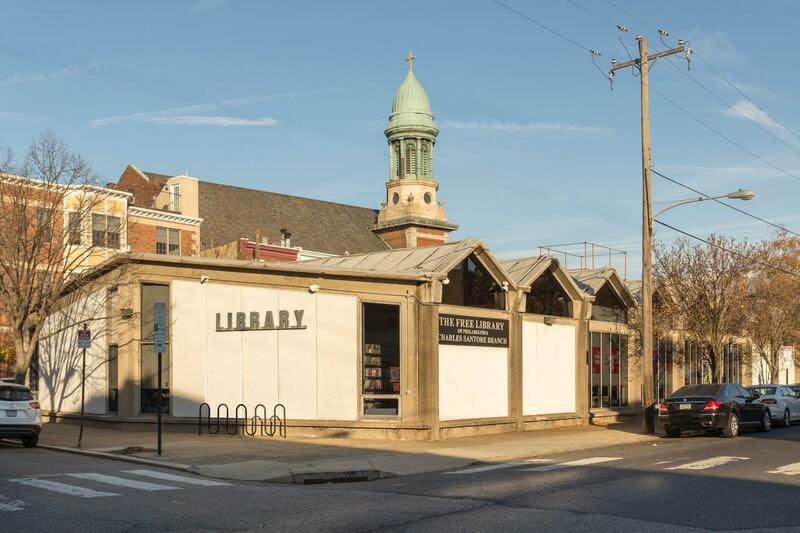 About The Free Library of Philadelphia Charles Santore Branch: The Charles Santore branch serves the South Philadelphia communities of Bella Vista, Queen Village, and Hawthorne with a variety of invaluable services. Located at the intersection of Carpenter and 7th streets, this beloved neighborhood branch is only a short walk from Philly’s famous Italian Market and South Street. Meet the Friends: Friends of the Charles Santore Library is a nonprofit organization dedicated to ensuring that our community has access to everything that this beloved branch has to offer. From recruiting staff to organizing and executing excellent Library programming, the Friends are honored to advocate on behalf of the Charles Santore Library and partner with the community in support of everything that the Library has to offer.